Crystal Bowls from Singing Rainbow, Inc. 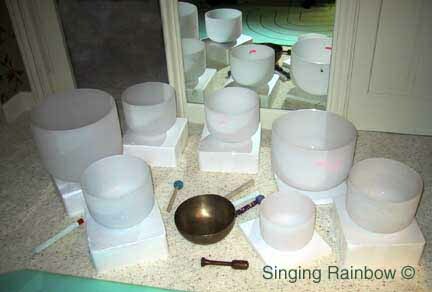 Crystal Singing Bowls and Tibetan Bowls for Music Therapy, Balancing, Sound Healing, and Bliss! Quite a few people purchase what is called a Chakra Set. Chakra Sets include 1 bowl for each Chakra, or energy center, in the body. Bowls for a set may be purchased all at once, which saves you money, or they may be purchased 1 or 2 at a time. Sets with 7 Bowls in 7 Notes for the 7 main Chakras are the most popular. Each of these notes has a correspondence with one of the chakras, therefore the name "Chakra Set". Everything you need is included, such as a striker for each bowl, rubber o-ring bases, and playing instructions. We also have 8, 9, 12 and 13 bowl sets, which bring in tones for additional chakras and the acupuncture meridians. Chakra sets are CUSTOM DESIGNED to exactly meet your requirements. We will help you decide which set is the best choice for you! Email us for advice. Remember, each different Chakra note can come in several sizes of bowls, so that gives us a large selection of bowls to choose from for your set. We do the work of putting it all together correctly and harmonically - you enjoy the benefits! Remember, if you want another combination of sizes than those listed, we can provide what you want. We specialize in crystal healing, music therapy sets of quartz crystal singing bowls at discount prices. The ultimate meditation music!